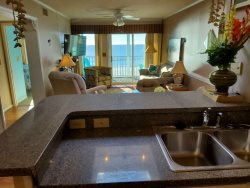 If you're looking for comfortable, clean and spacious Myrtle Beach or North Myrtle Beach condo rentals, you're in the right place! At Grand Strand Vacations And Rentals we don't believe in quoting a low-ball rate then adding hidden fees for things like linens and more at checkout. We're here to make your vacation as stress-free as possible. Choose from 2 to 5 bedroom Myrtle Beach condos perfect for your next beach vacation. Browse our inventory and book online or call our friendly reservation staff. We're happy to answer all your questions and help in any way we can to make your next vacation your best vacation yet!